Succulent meat with crisp, crunchy crackling – pork is perfect for roasting. Whether you prefer the rich, fat-seamed meat of belly pork, or a lean loin roast, versatile pork has it all. Here are some simple tips and ideas to make your roast pork the best ever. 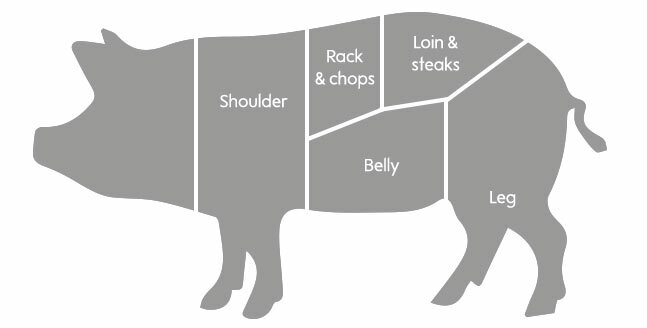 Which pork joint you choose for roasting depends on personal taste. Pork leg and loin joints are excellent roasting joints with lean meat and good crackling, and a rack of pork is an impressive looking roast. If you prefer something richer, then shoulder joints and pork belly are ideal. They have a higher fat content that renders down during cooking to give lovely tender meat. 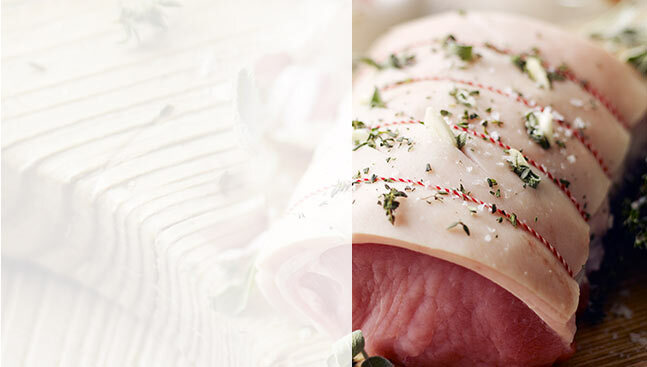 If you want a quick and easy roast, a piece of pork fillet will roast in 30-40 minutes. It’s lean and delicious when wrapped in a few slices of parma ham before roasting. If possible, buy a slightly larger joint than you need, as large joints tend to shrink less in the oven, and you can always use the leftovers another time. If you want a good layer of crackling, choose a nice even shaped joint with a good layer of fat beneath the rind. The rind should be scored at finger width intervals. For boneless meat, allow 225g meat per person, so if you’re looking for a boneless loin, leg or shoulder joint to serve 6 people, choose one around 1.5 – 2kg. If you’re cooking a joint of pork with crackling, preparing the crackling begins as soon as you get it home. Take the joint out of any packaging and dry the joint thoroughly, taking extra care to get the rind completely dry. Cover loosely with a clean tea towel and store in the fridge. Take large joints out of the fridge one hour before cooking to allow them to come to room temperature and cook more evenly. For a crackling joint, dry the rind again and rub one tablespoon of sea salt into the rind 30 minutes before cooking. Weigh your joint and calculate the cooking time according to the guide below. Choose a roasting tin that’s a little larger than the joint – not too large, or the precious gravy juices will evaporate. A peeled and halved onion added to the roasting tin while your pork cooks will caramelise and add flavour to the gravy. You could also add a few sprigs of herbs such as sage or thyme, or even a few slices of apple. Sprinkle the crackling with a little extra salt just before cooking. Preheat your oven to the correct temperature. With all large joints some cooks like to roast them for the first 20 minutes on a high heat to allow the heat to penetrate quickly. With crackling joints this is essential for the first 30 minutes. Good crackling forms when the fat beneath the rind melts and pushes up through the rind, basting it with fat and making it crisp. Preheat your oven to 220C/Gas 7/fan 200C. Remember to reduce the temperature after 30 minutes – you can leave the oven door open for a couple of minutes to help it cool down. Do not cover pork crackling joints while they’re cooking, or you’ll be left with soggy crackling. There’s no need to baste pork while it’s cooking as the fat should keep it moist, but some cooks like to brush the crackling with a little extra oil once or twice. Cook for for 30 minutes, then reduce to 180C/Gas 4/fan 160C for the remaining time. Calculate total cooking time for 35 minutes per 500g, plus 35 minutes. Pan fry pork fillet in 1 tbsp oil for 4-5 minutes to seal the meat on all sides. Transfer to the oven and cook for 5 minutes per 100g. When the cooking time is up, test to see if your pork is cooked by pushing a skewer into the thickest part of the meat. The juices should run completely clear, with no hint of pink. Pork should never be served rare. If you have a meat thermometer, push the probe into the meat as close as possible to the centre (avoiding any bones) and leave it for 20 seconds before taking the reading, which should be 65-70C. Resting allows the juices in the outside of the meat to settle back into the middle and throughout the joint, making it juicier and easier to carve. Transfer your cooked pork joint to a warm platter or clean board and cover with foil. Leave it to rest for at least 20 minutes before carving. It’ll give you time to make the gravy and finish off any last minute trimmings too! An elegant red full of raspberry and cherry flavours with soft tannins that perfectly matches a succulent pork roast.